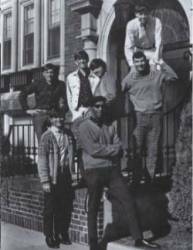 In 1964 Rick Mellor, a student at Morningside College in Sioux City, formed a band that included six other musicians attending the school. They took the name "7 Sons" and obtained the services of well known orchestra leader Eddie Skeets as their promoter. They performed throughout the Midwest, including places like the Red Dog Inn and the Roof Garden. They also toured with many national acts like Bobby Vee, Herman's Hermits, the Mammas and Papas, and Paul Revere. The 7 Sons recorded a number of 45's, including a great rendition of House of the Rising Sun. After a successful four year run the guys graduated and went their separate ways but their high energy shows were not to be forgotten. They were inducted into the Iowa Music Association's Hall of Fame in 2002.